The sample fact table we'll use for this example. You can try out the steps below yourself by downloading the Excel workbook containing these rows. You want to load this into a tabular data model, bit by bit. How to manage the process? I couldn't find an official approach anywhere, but the method shown below certainly works. I'm using Visual Studio 2017 and SSAS Tabular 2016, but think this method will work for all software versions. While importing your fact table, click on the Preview & Filter button. 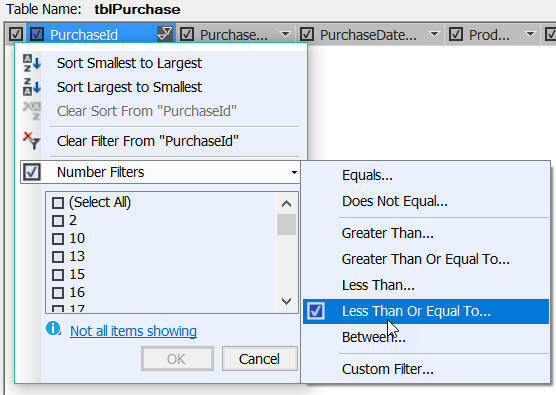 Here we set the filter to import only rows where the purchase id is less than or equal to 0 (which can never happen, since this is an identity column). No rows have been imported. Start by choosing to create table partitions (you should have the table in question selected when you choose this menu option). Here I've divided the data into pre-2016, 2016, 2017, 2018 and post-2018. First choose this menu option to load data for specific partitions. Tick the partitions you want to process. OK, so I didn't actually have any data after 2016 (this is an older dataset). 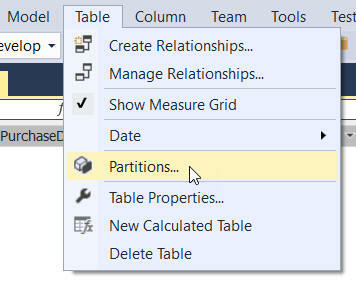 By setting up your partitions sensibly, you now have complete control over how you process your fact table!